This Beneteau Oceanis 58 sailboat, built in 2012 is an excellent choice for those wishing to experience a new sense of freedom in style and comfort. Wake up to the sound of the sea in one of the Beneteau Oceanis 58’s 4 spacious and modern cabins. Sleeping up to 10 people, this sailboat is perfect for sailing with friends and family. 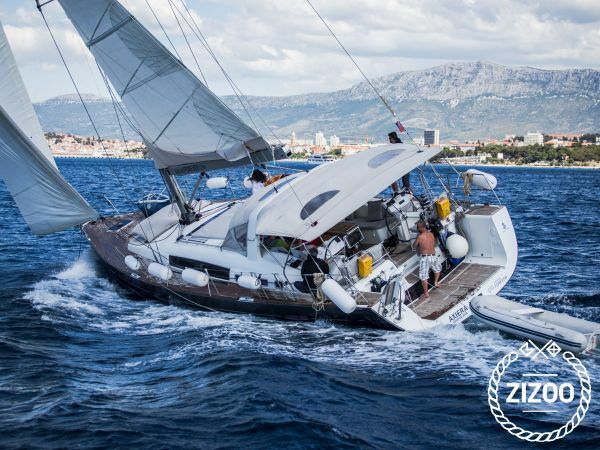 The Beneteau Oceanis 58 is located in Marina SCT (Trogir). Trogir is a convenient start point for exploring Croatia by luxury sailing yacht. Happy sailing. Basic price includes this services: - Charter assistant 24/7, pilot books in several languages and navigation charts, - Transport from/to Split Airport or Parking for 2 cars/week in Marina, - Skipper services included (food for Skipper is covered by client) - Internet 4G LTE (Unlimited data) + WiFi (AC) on board.